Few people would argue against the idea that the late 1960’s/early 1970’s was a time of tremendous change in our music and our politics. Author Steve Millward picks one year, 1970, to highlight what was happening politically and socially in the music scene. While Millward does touch on events world-wide he focusses primarily on the United Kingdom and the United States. In the US, Richard Nixon was still early in his presidency but feeling a lot of heat regarding Vietnam and Cambodia. In music, things looked a little bleak. The Beatles were working individually, with each of them releasing a solo album in ’70. Simon & Garfunkle, a duo that typified the folk scene, separated. And other big names didn’t seem to have the endearing magic any more. But just as you might expect, other musicians stepped up to fill the gaps and politics provided plenty of material for the social change called for in the songs. I was a pre-teen in 1970 and while my interest in politics at the time was zero, music (pre Pandora, Spotify and the internet) was one of the few things I could relate to and claim as ‘mine’ (since my parents weren’t very fond of it). Millward brought back many memories, but more importantly, showed me how the pieces of the music-scene jigsaw puzzle fit together. Motown found (or re-found) its voice and some of the big names that I followed for decades (James Taylor; Crosby, Stills, Nash [and Young]; Elton John) were emerging at this time. The only political talk from the 70’s that I could ever remember was about the Vietnam war (with a brother of draft age, this was a constant concern). I was unaware, until reading the book, of the political strife facing the UK, beginning with Prime Ministers who have been rated among the worst in British history. I struggled with the book early on … perhaps in part because I wasn’t aware of the sort of book I was about to read … but as I got further and further into it, the more I could sense the bigger picture and how it all fit together and I didn’t want the book to end. If there were another book, for 1971, I’d have dived right in. Looking for a good book? 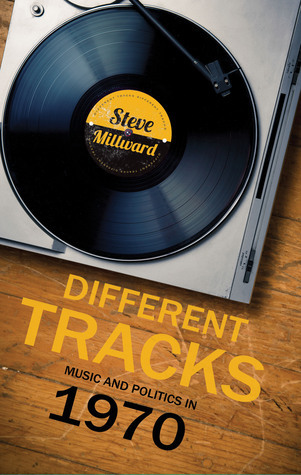 Different Tracks is a social history book looking at music and politics from the year 1970 and will educate and stimulate any reader interested in music, politics, sociology, or history. It is highly recommended. Looking for a good book? Different Tracks is a non-fiction book that will appeal to fans of classic pop music, politics, sociology, and history. it is a fascinating look at our culture in 1970 through music and politics. And because I recognize the similarities between graphic novels and theatre scripts, I tend to hold graphic novel stories to the same standards as a play script. In the case of Wildfire, written by Matt Hawkins, the story holds up very well and although sci-fi it holds such an incredible foothold in reality that it is a little scary. If you lived in farm country, or have ever driven by a sizeable farm, you’ve seen the signs from laboratories that are providing the farmers with fertilizers or pest controls (or both). 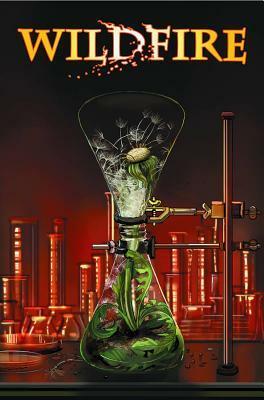 Wildfire imagines if some laboratory is experimenting with a special growth hormone for food to rapidly speed up the growth process in order to plant and harvest on a much quicker scale in order to be able to plant and harvest more food to feed our too-rapidly growing population. But what happens if that hormone spreads to the crops that we DON’T want? Dandelions. Poison ivy. Poison oak. Crab grass. Etc etc etc. We can sometimes become so focussed on a goal that we fail to see the other, dangerous, possibilities. Hawkins’ story moves quickly and is full of characters ‘who want and need to act.’ We don’t spend a lot of time sitting around and contemplating the effects, as writers often like to do — debate the pros and cons — but we jump right in to goals and obstacles with a lot of dramatic tension and suspense. In case you can’t tell … I really like this story. It’s well paced (if anything…it’s a touch too fast) and extremely topical. The art, by Linda Sejic, works nicely for the book. It is not the super-realistic, 3D style of many books, but much more like the comic book art of the 1970’s and ’80’s. And for someone like myself, who grew up with those books, it was very comfortable. Looking for a good book? Wildfire, Volume 1 is a graphic novel that works well on many levels and should appeal to readers who’ve never read a graphic novel before as well as fans of the genre. I received an electronic version of this book from the publisher, through Netgalley, in exchange for an honest review. Back in May I reviewed the first book in the UFiles series by Chris d’Lacey, and was quite spellbound with the book. I was fortunate enough to see that book two was now available for review and eagerly began to read. 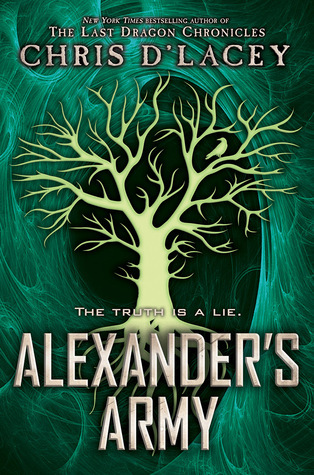 There is still a fair amount of science fiction, mystery, paranormal activity, action/adventure, and the altering of realities, but Alexander’s Army takes a darker tone than I saw with book #1. Michael Malone is a teen who has been recruited into a highly secret organization, known by their acronym UNICORNE, because of Michael’s ability to alter (change) reality. Michael has learned that his father, who has been missing since he was much younger, was also a member of UNICORNE. Michael is still hoping he might find out where his father is. In Alexander’s Army, Michael is given an unusual assignment of infiltrating a comic book store that has had a recent history of unusual activity. And the fact that they are displaying a new comic with a character that is eerily familiar makes Michael uncomfortable when he enters the shop. As with the first book, there are moments where it feels as though author Chris d’Lacey is trying to do too much, which muddies and slows the story. Here that happens near the climax of the action where the action portion of the story would be enough for almost any book, but here we have multiple layers of story with the over-arcing story, that of Michael trying to find his father (which is the piece that holds the individual books together), also trying to command focus. I don’t want to give anything away because d’Lacey builds his story carefully with each moment being a sort of “ah ha!” moment, but instead of being some sort of big reveal, it really is just one of many story-building blocks along the way. There’s always a trust between author and reader … trust that the author won’t disappoint and that everything (s)he is sharing is important to the story … and if the reader trusts d’Lacey through each building block, there won’t be any disappointment. But note what I wrote earlier … this story is darker and the fantasy element borders on a little creepy. 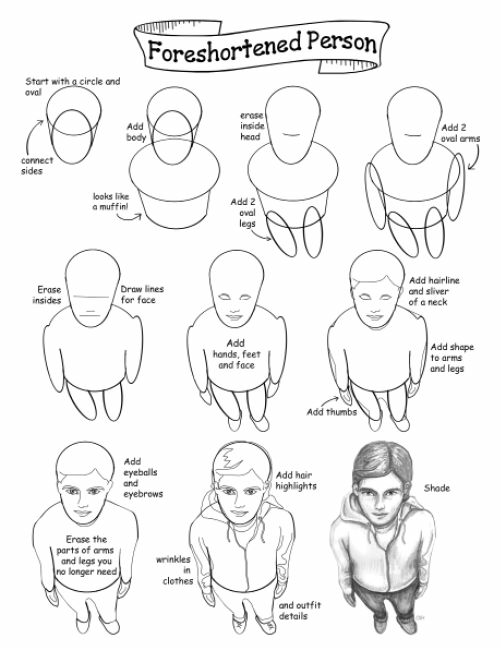 It just so happens that I like a little creepy, dark fantasy in some of my fiction, so this worked well for me. But what doesn’t work well is something I’ve written about before … the lack of ending. D’Lacey does bring about a conclusion to the immediate story of Alexander’s Army, but the larger story arc is hinted at very strongly and there are numerous story pieces that are unresolved. This leaves the reader unsatisfied with the book while also doing just what the publisher wants, which is to anticipate the next book in the series to find some resolution. I do not appreciate reading a book that doesn’t have a conclusion. Unfortunately (for me, but fortunately for d’Lacey and his publisher) I am hooked and want to see this story through. Looking for a good book? Alexander’s Army is a dark fantasy for young adults that intrigues and keeps the reader on edge, but beware — it is a part of a series and likely difficult to read as a stand-alone book. I wasn’t aware that this was a reissue when I requested it, not that it matters — it looked interesting. And it IS interesting and exciting. The book has had other titles: Jimmy Coates: Assassin? ; Killer; Jimmy Coates: Killer; and now, simply Assassin. All are listed as “Jimmy Coates #1.” But no matter what the title, this is one action-packed thriller that you won’t want to put down! Jimmy Coates is an eleven year old boy who discovers that he has some unusual abilities when he is most in need of them. Speed, agility, strength. These are not things that show all the time, but when some men are chasing him, his abilities come to him naturally. At home, his parents appear at first surprised, but surprised that these abilities are appearing now, not that he has them. When men come to take Jimmy away, his parents tell him to run, which he does, but only far enough to watch his family be taken away. When he goes to the local police department to report the kidnapping, the same men come from the police offices and try to capture Jimmy. Now on his own, Jimmy has to learn just what his powers are, why he has them and what it all means. Jimmy, it seems, is not so much a by, but an android, a cyborg — part boy, part machine — programmed to be an assassin for a secret branch of the (UK) government. The human part of Jimmy doesn’t want to kill. He only wants his family back. But now Jimmy has to fight with his own programming. This book is action-packed and well paced. Author Joe Craig knows how to keep young readers engaged, keeping the action moving at lightning speeds, but slowly down occasionally to give the reader a break and to deliver some much-needed information before picking up the pace again. Not knowing that this was a reissue, I wondered if there would be other books in the series. Well…there are. Currently there are seven books in the series and I’m very interested in reading more of these books. In this, book one, we get to discover who Jimmy Coates is … right alongside Jimmy himself, as he learns some fascinating things about himself. This adventure promises to be an exciting journey. Looking for a good book? 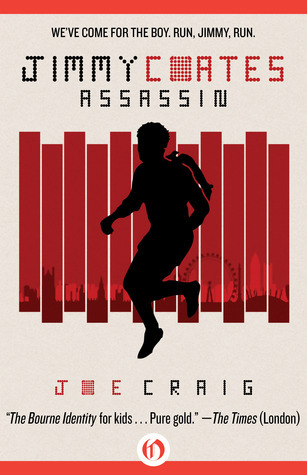 Book #1 in the Jimmy Coates series, Assassin, by Joe Craig, is a fast-paced action adventure for young readers and will not disappoint. I received this book, in electronic form, from the publisher, through Netgalley, for an honest review. A modern fable; an allegorical tale; a journey — an odyssey — that will bring to mind shades of other popular coming-of-age novels, such as The Catcher in the Rye, The Amazing Adventures of Kavalier & Clay, The Odyssey, and The Book Thief. Benditt’s world is both an imaginary one, and one that is all too real and recognizable to the reader. It is my town. It is your town. It is the world we live in. With the opening sentence (“The man of Small Island is dreaming of a wolf.”) we can predict that we are about to begin a dangerous journey. Our protagonist, who is generally referred to only as The Boatmaker, is a ‘man of Small Island’ — a place with no other name, but clearly an allegory for the safe haven of home … a place where a man is safe from the ravages of the larger world. But the fact that he is a boat-maker already suggests his eagerness and desire to explore the world beyond his Small Island. What the Boatmaker discovers during his odyssey outside of Small Island is women, religion, politics, greed, and racial hatred. Life on Small Island seems so much better, so much safer, but the Boatmaker also learns that it is impossible to un-learn what he has experienced. That you can never truly go back. Not knowing what to expect, it took me a bit to get in to the book. The lack of proper names, but instead the use of Boatmaker as pronoun, threw me off for a while. As I got a sense of the nature of the book, I went back to start it again, reading it as an allegorical tale, with each unique moment being a learning step along his way. With so many new books being published all the time, it is rare for me to re-read a book, but this one is definitely going on my re-read list! I think that there’s more here than I caught the first time around. Looking for a good book? Digging in to The Boatmaker by John Benditt is worthwhile, and the story will stick with you long after you put the book down. I received this book in electronic form from the publisher, through Edelweiss, for an honest review. I appreciate a wide variety of writing and art styles and even if something doesn’t reach me personally, I try to look at it from the point of view of the intended audience. But no matter how I try to look at this book, it just doesn’t work! 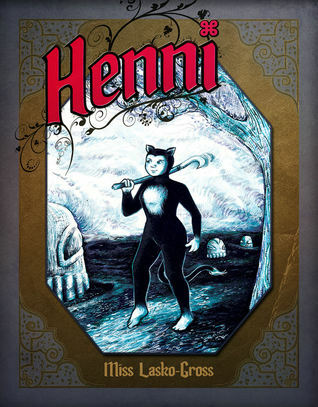 Henni is a graphic novel by Miss Lasko-Cross in which ‘Henni’ is a strange cat/monkey/human hybrid. According to the Goodreads publisher’s description, this story is a “commentary on religion, coming of age and being yourself.” ‘Commentary on religion?’ More like a diatribe. Henni is a young girl with an abundance of curiosity. The elders in her village remind her, time and again, that her place is to obey and to do what she is told. It is a way of life that her mother would send a bribe to the butcher so that his son might consider Henni for a bride. It is a way of life that it goes against the grain of their religion for her to be so forthright and to question everything. After being imprisoned and chained, Henni manages to turn the tables just enough at her trial (for sacrilege) in order to be banished rather than killed. Wandering in her banishment, she discovers that she isn’t the only one to question the ‘normal’ way of life. Once she realizes that there are others in the world, she decides that her father, who was taken from their home (in front of Henni), might still be alive. She heads off to look for him. End of story. This little parable is a little too obvious in its message and definitely treats religion — any and all religion — as dangerous to curious minds. 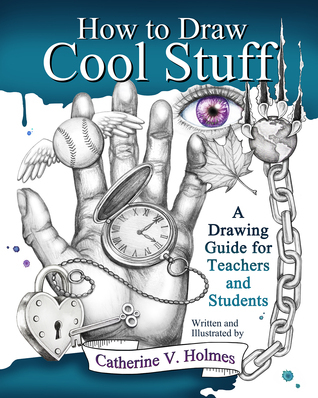 If this book is geared toward younger readers, it might actually prove to be more dangerous than the religions it proselytizes against, because the book doesn’t offer other options (it’s religion or death). We don’t know if Henni’s father was promoting some other way of life, or simply questioned the way of life just the way Henni does. The book ends on a cliff-hanger (literally, not figuratively) so there clearly must be another book planned, but this hit-us-over-the-head morality tale is difficult to follow because of the sudden leaps it takes as it moves the story along. The art is … well, different. The cat/monkey/thing is definitely unique but it never made a strong (favorable) impression on me. Because it wasn’t a human, the story took on the parable tone. But because of this, I wasn’t able to connect with the characters. There was nothing in Henni’s life that I could relate to. I appreciate the effort, but Henni doesn’t speak to me. Looking for a good book? 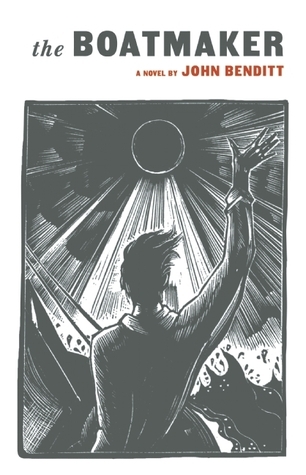 Henni is an unusual graphic novel by Miss Lasko-Cross that expresses the dangers of blindly obeying religion and has a ‘teen’ confronting the leaders of her village and paying the price of banishment for doing so. I received this book in electronic form from the publisher, through Netgalley, for an honest review.